ISLAMABAD: The federal government has decided to launch an inquiry into alleged manipulation in election results as the ruling Pakistan Tehreek-i-Insaf (PTI) believes that top officials of the National Database and Registration Authority (Nadra) were involved in “twisting the system”. 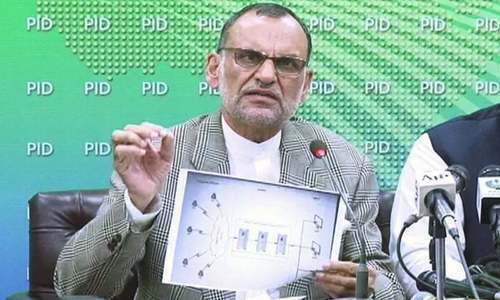 A press briefing held here on Friday by Information Minister Fawad Chaudhry and Senator Azam Swati, the chief researcher of the PTI, over complaints against the Results Transmission System (RTS) drew a strong reaction from Nadra. The PTI parliamentarians said there was no rigging in the July 25 elections, but “the flow of the results was deliberately delayed by Nadra”. Within an hour, Nadra came up with its reaction to the allegations, saying the notion presented at the press conference was incorrect and insisting that it’s RTS system had not failed. Nadra said there was no link between its RTS and the Result Management System of the Election Commission of Pakistan (ECP), adding that the authority was ready for any forensic audit. At the presser, Senator Swati said: “The only problem was cutting off the chain in the RTS by those at the helm of affairs in Nadra only to stop the flow of Form 45 electronically. Mr Swati said the results were pouring in up to 2am and the system crashed suddenly after 2am and Nadra came up with the allegation that the Result Management System of the Election Commission had failed. “But the break was at the end of Nadra in its RTS not RMS of the ECP.The system was operating smoothly up to 2am. Then how did Shabaz Sharif announce at 12am that the system of transferring Form 45 has crashed,” he asked. Senator Swati said the appointment of the Nadra chairman had always been controversial and an inquiry should be conducted by the National Telecommunication and Information Technology Security Board (NTISB). The board is a wing under the cabinet division and one of its responsibilities is to “Conduct of I and II layer IT Security audit of various ministries/divisions/affiliated federal bodies/attached departments”. “The NTISB has the capacity to conduct a forensic audit over the deliberate mismanagement by Nadra, but certain officers have to be removed so that auditors can have access to relevant data,” Senator Swati said. Earlier in the day, Information Minister Chaudhry, while talking to the media outside the Parliament House, claimed that the cancellation of blasphemous caricatures competition was due to diplomatic success of the new government. “After the prime minister’s speech, Foreign Minister Shah Mehmood Qureshi contacted the government of Holland and told it that the global community would hold it responsible if the contest was held,” Mr Chaudhry said. Asked about the lengthy visit of Imran Khan to the GHQ, the information minister, who had also accompanied the prime minister, said the government needed input of state institutions for devising state policies. He said: “There is clarity in the PTI government’s policy on foreign policy; (bilateral) relations have to be between the two states and should not based on personal friendships. The information minister lauded Pakistan-China ties and emphasised the importance of the China-Pakistan Economic Corridor. “China has great economic interest in Pakistan, it is not a geo-strategic agreement, but a geopolitical and geo-economic agreement,” he said. The information minister said that Pakistan would maintain an independent foreign policy. I myself was a presiding officer and RTS was not working at 10:00 pm, I made many attempts after 10 pm on election day and every time when I tried to take snap shot of the form 45 after logging in to RTS it failed with a message that RTS has stopped working. It consumed a lot of time without success. Thus, NADRA claim that RTS never failed is incorrect. Desired outcome has been achieved. Now probe for future elections to avoid mistakes. If the RTS failed, that doesn’t mean results were manipulated as presiding officers had to submit their forms 45s to the RO by hand anyway. The RTS was designed to speed up delivery of results only and was not designed to tabulate results.